GoXtra News: Tshepo Mngoma to headline Lion of Africa Music Expressions Concert! 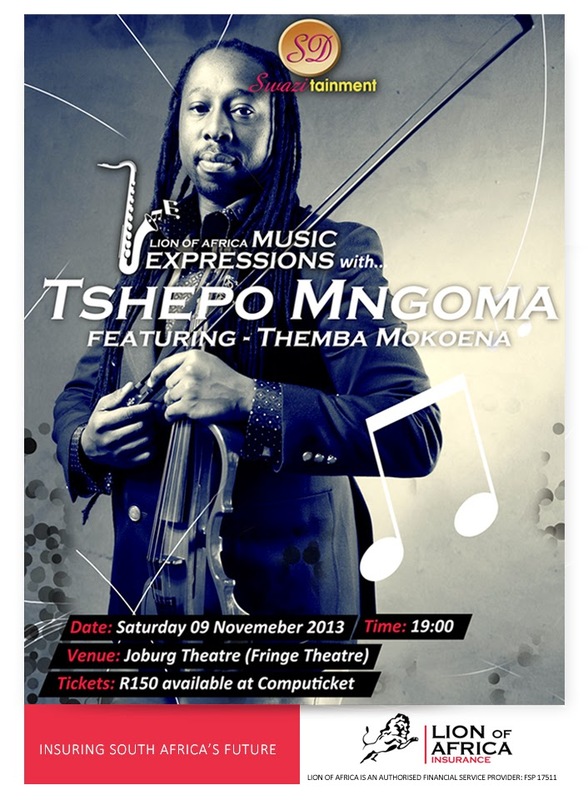 Tshepo Mngoma to headline Lion of Africa Music Expressions Concert! Music lovers can look forward to a spectacular evening of jazz music when award winning musician, Tshepo Mngoma, and veteran guitarist, Baba “Themba” Mokoena, take centre stage during the seventh installment of the Lion of Africa Music Expressions Concert. The music event takes place at the world-class Joburg Theatre in Braamfontein on Saturday, 09 November 2013. Mngoma has earned a reputation as a highly sought after music director, arranger, producer and violinist. His claim to fame came in 2009, following the release of his SAMA16 Best Newcomer award winning debut album ‘People and Places’. He has toured both internationally and here at home with the legendary Hugh Masekela both in the musical Songs of Migration and on Hugh and Friends along with Thandiswa Mazwai and Tshepo Tsola. Mngoma will perform some of his favourite songs such as Ingoma ka Mngoma, Mgqashiyo and Rise Africa amongst others. He will feature Baba “Themba” Mokoena, who needs no introduction. Mokoena started his musical career in the 70’s and is still regarded as one of the best guitarists in South Africa. The two artists will deliver a magical live music performance to prepare fans for the last installment of the Lion of Africa Music Expressions series concert for 2013 in December. Sponsored by Lion of Africa Insurance, in association with Swazitainment Productions, the Lion of Africa Music Expressions show takes place monthly. The music series aims to unearth new talent in the performing arts arena by featuring some of South Africa’s top music performers alongside other emerging creative talent in the performing arts.